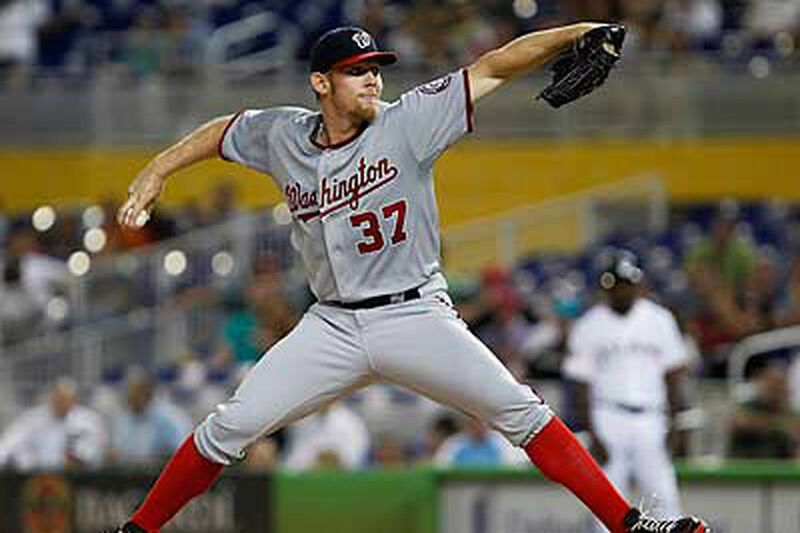 Washington Nationals manager Davey Johnson has made the Stephen Strasburg plan clear, sort of: The star has "probably ... two or three" starts left. "He might pitch 10 innings one game, or he might just go five," Johnson said on Thursday. "I asked [general manager Mike Rizzo], 'Do you want me to hook him after three? Save some innings?' "
Not that the early hook is the plan, Johnson quickly added. And the bullpen is not an option. "And, no, I'm not going to drag it out and give him seven days between starts, either," he said. So it looks like Sept. 7 is the shutdown date. Unless it's Sept. 12? October? CSNwashington.com's Mark Zuckerman pointed out in a tweet that the only teenagers to hit more home runs in a season than the Nationals' Bryce Harper (15) are Tony Conigliaro (who had 24, still the teen record, for the Red Sox in 1964), Mel Ott (who had 18 for the New York Giants in 1928), and Ken Griffey Jr. (who had 16 for the Mariners in 1989). All were 19 years old, as is Harper. Ott, of course, is a Hall of Famer, and Junior soon will be. It's always sobering to think of Conigliaro, who defined tragedy better than Aeschylus could for a generation of sports fans. In 1967, Tony C had his left cheekbone shattered and his retina damaged when he was hit by the Angels' Jack Hamilton. He made a decent comeback try, retired in 1975, had a stroke in 1982, went into a coma, and died in 1990. If Harper breaks the record (given that he hit three in a 24-hour span Wednesday and Thursday, it's likely), he'll replace a would-have-been great. The Baltimore Orioles, of all teams, are in the thick of the AL wild-card race and a very real threat to the New York Yankees for the AL East title. With a 5-3 win over Chicago Thursday, the O's took three of four from the AL Central-leading White Sox to complete a 5-1 homestand. The crab cake town's jumping, right? Nope. The O's drew a crowd of 10,141, smallest of the season at Camden Yards, for Thursday afternoon's win. Baltimore fans, your team starts a three-game series at Yankee Stadium on Friday night. Watch and learn. We have a feeling the fans in the Bronx will show up in force. Yankees' third baseman Alex Rodriguez, who is recovering from a broken left hand, is set to play for the single-A Tampa Yankees against the Lakeland Flying Tigers in the Florida State League on Friday. Contact Michael Harrington at mharrington@phillynews.com.